Hour of the need is money for many people and even if they had made investment say, under section 80C of our IT Act, they are not clear whether they are eligible to withdraw their money after maturity or partially. The post will give a clear idea about PPF Withdrawal. The PPF is a Central Government Scheme, which is a long term small savings scheme to provide retirement security to self-employed individuals and workers in the unorganized sector. PPF account can be opened in any branches of State Bank of India or its subsidiaries or select branches of designated nationalized banks or select Post Offices across India. How to open an account or rules is not a matter now. The point here is to withdraw on maturity or partial withdrawal from account or continuation of account after maturity with investment or earning interest without investment. Consider the below chart with applicable PPF rules where Rs. 1,00,000 is deposited in a PPF account from the Year 2011 to 2028. Account holder can withdraw from PPF account after completion after the expiry of 5 full financial years from the end of the year in which initial investment was made or say amount can be withdrawn after completion of 6 years. In the above case, account holder can withdraw money from his / her PPF Account only at the end of 6th Year of operation, so its ideally 7th year beginning. The PPF Withdrawal Rules in states that the maximum amount of withdrawal from PPF Account is 50% of the amount retained / remaining in the PPF account in the end of 4th year. In the above example its Rs. 3,55,293.45 INR and 50% of this amount is Rs.1,77,646.73 INR and so the Withdrawal Rules in PPF continues till the end of 12th year of which the amount can be withdrawn during the 15 year end. 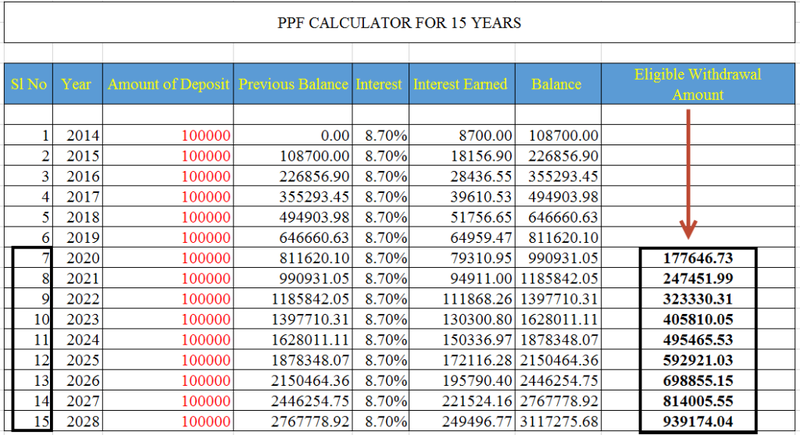 So ideally in PPF Withdrawal Rules is valid from 7th year end to 15th year end. On maturity, the account holder can decide to withdraw all the money which is exempted from tax. The account holder of PPF account can continue to invest in PPF Account after the completion of maturity period by extending his lock-in-period for block of 5 years. In-case, if the account holder chooses to extend the account without making any fresh contributions, the left over balance will continue to earn interest till it is withdrawn. For clear information about PPF account opening and withdrawal rules, refer Rajesh Goyal's article on PPF account AllBankingSolutions.com and www.ppfaccount.in.